Posted 5/28/17 – James Timphony, winner of the 2008, 2009 and 2014 Mt. Wilson Trail Races, found his way back to the top yesterday with a time of 1:01:38, followed by Jon Clark, who has locked down second place every year since he won the race in 2012, with a time this year of 1:03:52. Third place went to Michael Eastburn with a time of 1:04:17. 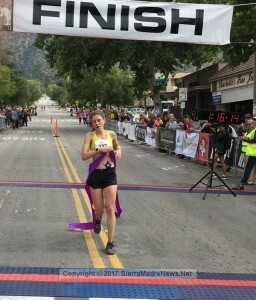 First place among women went to 2015 women’s champ Sally June Tracy with a time of 1:16:13, followed by Mireya Vargas, with a time of 1:17:38. Ms. Vargas was the female winner of the race in 2013, 2014 and 2016. Third place went to Linda Sereno, who makes the trip down to Sierra Mdare every year from Salinas, CA, with a time of 1:24: 19. 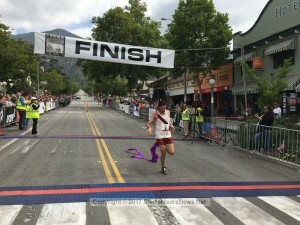 Sanduh Manbir, 1:15:11; Peter Shair 1:16:45 and Filiberto Arizmendi, 1:21:15 were the top three Sierra Madreans to finish the race, while Jill Liston, 1:29:03; Patricia Marshall, 1:36:01 and Tracy Sullivan, 1:36:06 were the top three female Sierra Madre finishers. The race was started by Ralph West, wearing bib number 45 to reflect his 45th consecutive running of the race. Simultaneous to Wilson’s shot to start the race, the bell in the bell tower in Kersting Court rang out, as well. The bell was restored to “ringable” condition earlier this month, for the first time in 43 years. I’ll be posting more pictures at some point.